Anybody who, like me, might want to know what it was like to live in South Vietnam in the last few months of the Saigon regime will find this novel riveting. Glenn shows what it was like for the Vietnamese and the remaining Americans after the United States had decided not to pursue the war any longer and had withdrawn its troops, basing its hopes on a peace treaty with the North. The plot is carefully constructed, and the story is told in vivid, economical prose. The experience of the last months before the fall of Saigon varied, depending on who you were. Glenn traces the story of Chuck Griffin, a U.S. intelligence analyst, several other Americans assigned to give assessments to the military and embassy, an American nurse, and Vietnamese of various ranks of society. The amazing thing is that life went on. U.S. personnel did their jobs despite all indications that Saigon was about to fall, and the South Vietnamese either refused to recognize the danger—like the U.S. ambassador—or stoically resigned themselves to defeat. Chuck, the main focus of the story, is an admirable character. He knows and respects Vietnamese customs and culture. When he falls in love with a Vietnamese young woman, he struggles to do what is right. His volunteer work in a Vietnamese orphanage shows his understanding of the horror of war, and yet he wishes, partly for personal reasons, that the U.S. would send troops back in to prevent the imminent disaster. When he realizes it is too late for this, he tries to convince the military and the ambassador that preparations for evacuation must begin. 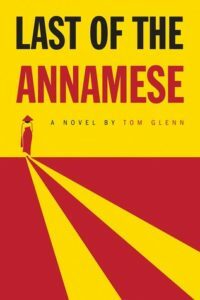 The novel gives a glimpse of a fascinating period of American and Vietnamese history written by a person who experienced it first-hand.